A Laboratorio de Inmunología Hospital Veterinario, Unidad Asociada a CONICET-Área de Cs. Agr. Ing. Bio. y S., Universidad Católica de Córdoba, Córdoba, Argentina. B E.E.A. Rafaela, INTA, CONICET, Santa Fe, Argentina. C Cátedra de Inmunología, Facultad de Medicina, Universidad Católica de Córdoba, Córdoba, Argentina. D Establecimiento Los Talas, Potrero de Garay, Córdoba, Argentina. Caseous lymphadenitis is a chronic suppurative bacterial disease caused by Corynebacterium pseudotuberculosis, and it has a high prevalence among small ruminants. Different vaccine preparations have been employed to control this disease. The adjuvant used in the formulation is a critical factor for the improvement of vaccine efficacy. No commercial vaccines are available in Argentina. The aims of the present work were to compare the specific antibody response against a C. pseudotuberculosis whole cell vaccine formulated with a classical and an immunoestimulant adjuvant in pregnant goats, and to assess the transfer of vaccine-specific antibodies from the goat to the offspring through colostrum. Twenty three pregnant goats were vaccinated. The animals were randomly allocated to three groups: control, aluminum hydroxide Al(OH)3 adjuvant and a new cage-like particle adjuvant (ISPA). Antibodies (IgG) against this antigen were measured by ELISA. A robust humoral immune response was detected in vaccinated animals, with production of specific IgG. No significant differences were found between the vaccines formulated with different adjuvants. High levels of specific antibodies were detected in colostrum samples from both immunised groups, which were passively transferred from goats to offprings. No adverse local reactions in the vaccines injection sites were detected. Caseous lymphadenitis, also called pseudotubercu losis, is a chronic suppurative bacterial disease caused by Corynebacterium pseudotuberculosis that presents a worldwide distribution and has a high prevalence among small ruminants, also affecting cows, horses and other domestic animals (Belchior et al 2006). In addition, it has been currently recognised as an emerging zoonotic disease (Palmero et al 2013). There is scarce information about the prevalence of this disease in goat herds in Argentina, which appears to vary according to the geographical area and type of production system. In the North West of the country, particularly in the arid ravine of Jujuy and Salta, a 60% prevalence of pseudotuberculosis was reported recently (Suárez et al 2016), whereas in the Chaco Salteño area the prevalence was only 15.6% (Suárez et al 2015). Pseudotuberculosis is characterised by the formation of encapsulated abscesses containing thick, caseous pus, most frequently within peripheral lymph nodes, but also within internal lymph nodes and organs (Fontaine et al 2006). Economic losses are mainly due to the progressive deterioration of the general condition of the animal, which results in decreased production of wool, meat, milk, as well as reproductive disorders and confiscation of viscera at the slaughterhouse (Belchior et al 2006). C. pseudotuberculosis can become endemic in a herd and disease eradication is problematic due to poor response to antibiotic therapy, organism ability to persist in the environment and difficulties in detecting subclinically infected animals (Al-gaabary et al 2009). The situation is aggravated by the absence of commercial vaccines available in Argentina (Palmero et al 2013). There are numerous reports on vaccination against C. pseudotuberculosis in ovine species, with few studies in goats (Baird et al 2007). Different antigen preparations have been employed, such as formalin-killed bacterins, bacterial cell wall preparations, phospholipase D toxoid and the use of immunostimulants including oligodeoxynucleotide containing unmethylated CpG dinucleotides with little success (Brogden et al 1996, Brogden et al 1984, Eggleton et al 1991, Cameron et al 1972, Moura-Costa et al 2008, Brown et al 1986) . The adjuvant used in the formulation is considered a critical factor for the improvement of vaccine efficacy. The most frequently employed adjuvants in veterinary vaccines have been Freund’s incomplete adjuvant (Moura-Costa et al 2008) and Al(OH)3 (Fontaine et al 2006). New immunostimulant complexes (ISCOM) have been developed (Morein et al 1984, Sjolander et al 1998). These com pounds induce strong cellular or humoral antigen-specific immune responses to a wide range of antigens (Sun et al 2009), being both antigens and adjuvant formulated in one and the same nanoparticle (Morein et al 2004). These nanoparticles are composed of saponins, cholesterol and phospholipids that are kept together through hydrophobic interactions (Morein et al 2004). The capabilities of this type of adjuvant are not restricted to particulate antigens, a recent study reported the use of ISCOMATRIX™ as an adjuvant for a Staphylococcus aureus whole cell vac cine that was evaluated in cattle with promising results (Camussone et al 2013). In addition, a new cage-like particle adjuvant (ISPA), structurally similar to ISCOM, was recently developed and evaluated in a murine model using a Trypanosoma cruzi recombinant protein antigen (Bertona et al 2017). However, the potential synergic effect of this adjuvant in the use of whole cell vaccines has not been evaluated. In goats, the newborn lacks specific protection against the pathogenic challenges of the environment, since the syndesmocorial type of placenta does not allow the passage of antibodies. Therefore, the immunoglobulins synthesized and derived from the goat should be transferred through colostrum (Cooper et al 2014, Fernández et al 2006, Iepema et al 2008, Rudovsky et al 2008). Pregnant females should be vaccinated at approximately 4 weeks before the probable date of birth for an adequate transfer of passive immunity through colostrum to control specific infectious diseases. The aim of the present work was to evaluate the spe cific antibody response against a C. pseudotuberculosis whole-cell vaccine formulated with Al(OH)3 and ISPA adjuvant in pregnant goats, and to assess the transfer of vaccine-specific antibodies from goat to offspring through colostrum. The vaccine was formulated using the method described by Fontaine et al (2006) with slight modifications. C. pseudotuberculosis (UTK 224), previously characterised by phenotypic and molecular methodology (Auad et al 2017), was briefly cultured on blood agar (BA) plates, and bacterial colonies were collected using sterile, cotton-tipped swabs moistened with sterile PBS. Bacterial cells were quantified by standard methodology and approximately 109 CFU were suspended in 20 ml of PBS and formalin was added to a final concentration of 0.2% (v/v). Cells were incubated overnight at 4 °C. Aliquots of 100 pl of the bacterial suspension were plated onto BA plates, incubated at 37 °C and monitored daily for 5 days to confirm bacterial killing. Bacterial cells were pelleted by centrifugation at 3,000 g and resuspended in PBS. The vaccines were for mulated using a different adjuvant. Aluminum hydroxide (Alhydrogel™) was added to bacterial suspension to 15% (v/v) final concentration and incubated during 1 h at 100 rpm. Immune stimulating particles (ISPA) were added to bacterial suspension at 2 mg/ml final concentration and mixed by inversion (Bertona et al 2017). Twenty three pregnant goats in the last trimester of gestation and thirty goat kids obtained by crossbreeding Criollo x Anglo Nubian and belonging to a goat farm located in Córdoba province, Argentina, were randomly allocated to three groups: G1 (control group): 9 goats vaccinated with saline solution and 13 goat kids; G2: 8 female goats vaccinated with FKC of C. pseudotubercu losis in Al(OH)3 adjuvant and 8 goat kids; and G3: 6 goats vaccinated with FKC of C. pseudotuberculosis in ISPA adjuvant and 9 goat kids. Goats were immunised subcutaneously behind the front leg with 1 ml of vaccine at approximately 110 (first dose) and 131 (second dose) days of gestation according to the expected day of parturition. Goats were bled by puncture of the jugular vein before immunisation (T0), 21 days after first immunisation (T1), and at the time of parturition (T2). Newborns were bled 48 hours after birth. Blood was allowed to clot and sera were collected and centrifuged at 1000 x g for 10 minutes. After parturition, colostrum samples were collected and centrifuged at 13,800 x g for 10 minutes, supernatants were collected and stored at -80 °C until processing. All the procedures were carried out according to the Guide for the Care and Use of Agricultural Animals in Agricultural Research and Teaching1. Antibodies (total IgG) against C. pseudotuberculosis were measured by ELISA. Flat-bottomed 96-well microtitre plates were coated with a suspension of bacterin (1x107 CFU/well) in PBS (pH 7.2) as previously described (Camussone et al 2013). The coated plates were first in cubated with 5% low-fat cow milk in PBS and then with goat's sera or colostrum diluted in PBS or with PBS only as blank control. Between each step, plates were washed three times with 0.05% Tween 20 in PBS. After washing, peroxidase-conjugated rabbit anti-goat IgG (Pierce®) was added. All incubations were 1 h at 37 °C. Lastly, enzyme substrate (H2O2/tetrametylbenzidine) was added and the reaction was stopped by the addition of 0.25 m-H2SO4. The absorbance was read at 450 nm (Infinite® F50, Tecan, Austria) as previously described (Camussone et al 2013). Antibody levels were expressed as optical density (OD). Samples were assayed in duplicate. Working dilutions of goats sera, goat kids sera and colostra were 1/5000, 1/2500 and 1/10000, respectively. In order to test the differences caused by immunisation, one way repeated measures Anova was performed using Rank transformation because the residuals are not normal and homoscedastic (Sokal and Rohlf 1995). One way Anova on colostrum and kid sera values was performed. In all the cases, Student Newman Keuls post hoc was performed, significance was 5% and the software used was R version 3.3.2 (R Core Team 2016). Mean and standard deviations were reported. No differences in antibodies levels against C. pseudo tuberculosis were detected at T0 between animals in Al(OH)3, ISPA or control groups. At 21 days after the first immunisation (T1), the group of animals vaccinated with bacterin formulated with Al(OH)3 (G2) showed significant differences with respect to the control group (G1), while no differences were observed between the group vaccinated with bacterin formulated with ISPA (G3) and the control group (G1). At the time of birth (T2) both vaccinated groups showed significant differences with respect to the control group (table 1). Table 1 Antibody levels in pregnant goats immunised with a C. pseudotuberculosis vaccine formulated with different adjuvants at dif ferent times of study (T0: before immunisation; T1: 21 days after first immunisation; T2: time of parturition)*. OD means and standard deviation (SE) of IgG specific in goat’s serum. Different letters imply significant differences. Anti IgG specific response between goats from the same group was also compared. No differences in IgG levels were observed within the control group at any sampling time (G1). In goats vaccinated with bacterin formulated with Al(OH)3 (G2), differences in serum IgG levels between T0 and T1 were observed. However, after administration of the second vaccine dose (T2), IgG levels did not increase significantly. In G3 (animals vaccinated with ISPA as adjuvant), significant differences were found between T0 and T1 and between T1 and T2 (figure 1). The antibody response presented significant changes in time (F=58.641; P<0.001) and this changes were related to the effect of immunisation (F=8,698; P=0.002) and to the interaction between them (F=41,497; P<0.001). 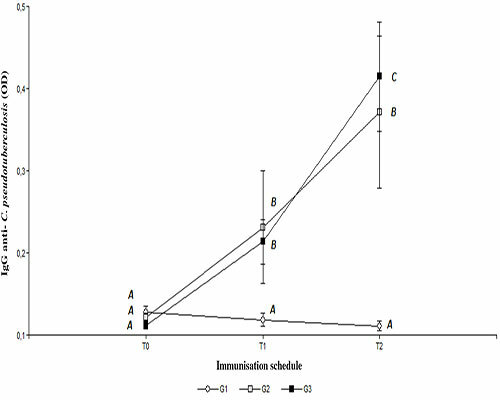 Figure 1 Serum antibody levels within each group of pregnant goats immunised with a C. pseudotuberculosis vaccine formulated with different adjuvants over time (T0: before immunization; T1: 21 days after first immunisation; T2: time of parturition)*. Specific IgG is expressed in OD. References: G1: control; G2: FKC in Al(OH)3 adjuvant; G3: FKC in ISPA adjuvant. Different letters imply significant differences. *Differences within the same treatment group over sampling time were analysed. After the administration of two doses of vaccine, both immunised groups showed an increase in IgG specific for C. pseudotuberculosis. In previous studies carried out in two groups of goats, one inoculated with secreted C. pseudo tuberculosis antigen associated with Freund’s incomplete adjuvant and the other group with oligodeoxynucleotide containing unmethylated CpG dinucleotides (CpG ODN), a significant increase in humoral immune response after vaccination was observed (Moura-Costa et al 2008). However, differences between C. pseudotuberculosis antigens and adjuvants used for vaccines formulations, do not allow for direct comparisons with the present study. There is little experience in the usage of immune stimu lating complexes in the formulation of whole-cell vaccines. In a previous work, immunisation of pregnant heifers with a S. aureus bacterin formulated with ISCOMATRIX™ in duced specific total IgG responses in sera and milk; higher than those obtained with the same immunogen formulated with Al(OH)3 (Camussone et al 2013). In addition, it was observed that ISCOMATRIXTM adjuvant associated with viral antigens generated enhanced and accelerated immune responses in mice and Guinea pigs (reviewed by Maraskovsky et al 2009). These observations differ from results obtained in the present study, since regardless of the adjuvant used, the total IgG response did not differed significantly between vaccinated groups, both in serum and colostrum. However, direct comparisons with previous studies are difficult due to differences in the antigens (bac terin vs viral antigens), animal species and adjuvants used. Immunised goats yielded significantly higher levels of anti- C. pseudotuberculosis specific IgG antibodies in colostrum than goats from the control group. No differences were observed in IgG levels between animals in Al(OH)3 or ISPA groups (table 2). Table 2 Antibody levels in colostrum of goats and sera of goat kids following immunisation of pregnant goats with a C. pseudotuber culosis vaccine formulated with different adjuvants. OD means and standard deviation (SE) of IgG specific in colostrum and goat kid's serum. Different letters imply significant differences. At 48 hours post-birth, newborns from immunized goats evidenced significantly higher levels of IgG anti-C. pseudotuberculosis in sera than those from control mothers; being IgG levels in newborns from Al(OH)3 group similar to those from ISPA group (table 2). A higher concentration of specific colostral antibodies was observed in vaccinated animals, regardless of the vaccine used. In the present study, both evaluated formulations achieved the passive transfer of immunity to goat kids. Although no direct comparisons can be made due to the different nature of vaccines employed, the manufacturer of a commercial C. pseudotuberculosis vaccine for goats (Glanvac® 3 for goats - Zoetis - Australia), recommends to vaccinate pregnant naive animals with 1 ml dose of vaccine at the time of mating and a booster vaccination 4 weeks before the expected time of kidding to allow protection of the kids the first 6 to 8 weeks of life due to the passage of antibodies through the colostrum. Regarding the vaccine evaluated in the present experiment, further studies will be needed to determine the antibodies half-life to design a vaccination schedule for the kids to allow for extended protection. In conclusion, a strong specific total IgG response was observed for the vaccine formulated with both adjuvants without finding differences between the formulations used. However, this response was earlier in those goats that received the vaccine formulated with Al(OH)3 as an adjuvant. In addition, high levels of specific antibodies were transferred to the goat kids through colostrum from both immunised groups and no adverse reactions were observed in the vaccines inoculation sites. The authors would like to thank the Secretary of Research of the Universidad Católica de Córdoba for their finance support. They also thank Dr. Iván Marcipar (Universidad Nacional del Litoral) for providing the ISPA adjuvant, and Dr. Gustavo Lagioia (Biogénesis Bagó) for providing the Al(OH)3 adjuvant. 1FASS, Federation of Animal Sciences Societies. 2010. Guide for the care and use of agricultural animals in research and teaching. 3rd ed. FASS Champaign, Ilinois, USA; http://www.fass.org/docs/agguide3rd/Ag_Guide_3rd_ed.pdf. *Corresponding author: J Auad; Av. Armada Argentina 3555 CP X5016D- HK, Córdoba, Argentina; jorauad@gmail.com.